Summer 2018 and festival season is well under way!!! 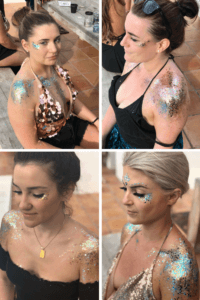 So we wanted to bring you 7 of what we think are the best festivals left this summer along with some inspo on the hottest looks from Ibiza which are sure to be perfect for your festival season. From the white isle to festival fields braids & plaits are this years go to hair style! Why? maybe because not only do they look wicked they stay in place and last as long as you can!!!! 1. Uber long pastel rainbow braids make sure your look is so on point!! Top Tip: Two days in and running low on dry shampoo, it must be time to style out a head scarf? to cover up those unwashed roots! 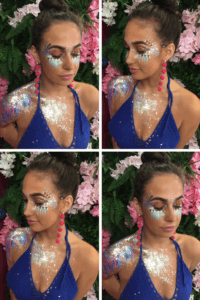 Stand out from the crowd USING OUR UNIQUE mixture of glitter, gems and paint to create one off looks. Here are three of our top tips to create the perfect look! 2. 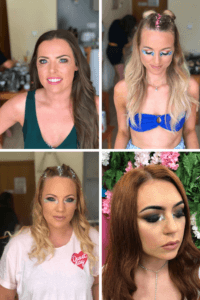 Symmetry – When creating your perfect festival look, use symmetry to compliment your facial features! Because no festival is complete without sparkle! 1. Shimmy shoulders are hitting the dance floors of ibiza and sure to be making their way to the uk festival circuit! Using your fave Kiss My fairy Glitter dust both shoulders to ensure……..
2. Glitter tears – The only tears we are crying this year are tears of glitter!!! Apply a small amount to the inner and outer corners of the eyes to finish off a glam make up look or add a small amount to the corners of the eye. To create the perfect glitter tears use a small brush and PLACE THE GLITTER DIRECTLY UNDER THE BOTTOM LASH LINE! 3. 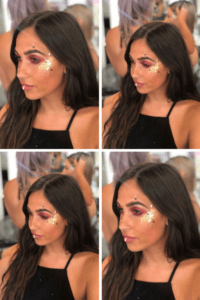 Glitter that BOOTY – Are you daring enough to rock a festival peach???? ?…… This year we have loved using contrasting colours like bright blue and gold or multi-coloured to really make that peach pop!! Shake it like you mean it!!! Finally all there is to say is enjoy which ever festival you head to and look out for our FLASH SALES coming up before the events!! SAVE 25% on all our glitters using code “FESTIVALFEVER” from 12noon on 27th July until 12noon on the 29th July!